Two mild afternoons are ahead prior to another cold front. The weekend forecast is wet and tricky. Today and Tonight: After a start near freezing, Wednesday will be mostly sunny and considerably warmer than Tuesday. High temperatures are expected to be in the mid 60s with southeast winds of 5-10mph. Overnight, low temperatures will only slip to about 50 degrees. Up Next: Clouds will increase into Thursday but highs will approach 70 degrees. Light showers will be possible Thursday night into Friday morning due to another weak front. Temperatures will just drop a few degrees behind this system. 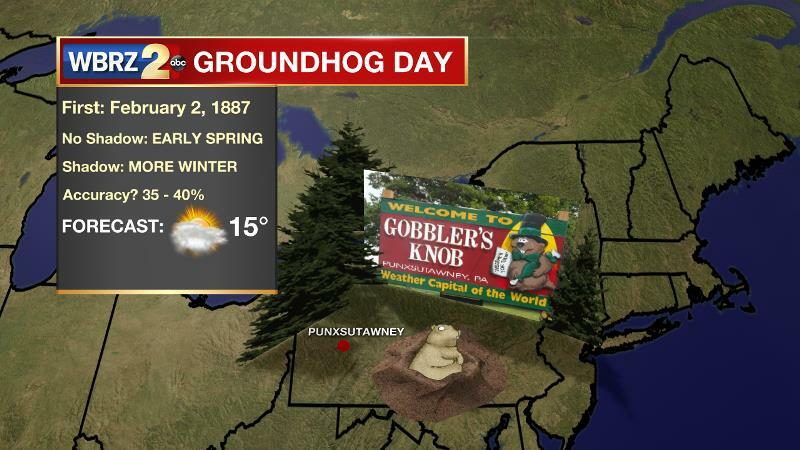 For Groundhog Day in Punxsutawney, Pennsylvania, mostly cloudy skies are forecast in the morning, increasing the likelihood that Phil will not see his shadow. Could that mean early spring? Historically, the rodent is only about 35 to 40 percent accurate. Hold the jokes… meteorologists are typically 90 to 93 percent accurate. Unfortunately, confidence remains low in the weekend forecast, which presents a challenge with regard to rain timing. Another front will bring some moderate rainfall to the region, but right now, it is unclear whether that begins on Saturday afternoon or holds off until night. The earlier any outdoor plans are on Saturday, the better the chance of staying dry. Then, on Sunday, the cold front will sweep through with rain followed by another cooler period for early next week. A surface high pressure system will move toward the eastern U.S. on Wednesday and as wind take on an east to southeast direction milder temperatures are anticipated when compared to Tuesday. Mainly sunny skies will persist though some weak mid-level positive vorticity advection and westerly flow may result in some passing clouds. The next trough will dive across the lower 48 into Thursday sending another cold front toward the central Gulf Coast. Moisture profiles look limited at best and the front may only have a broken line of showers leading it into the region. At this time, measurable rain is only forecast for 30-40 percent of the area and timing appears to be overnight Thursday into Friday. The trough basin will be just northeast of the region so seasonably chilly temperatures will be in place through Saturday morning. The forecast becomes more difficult into the upcoming weekend, particularly with regard to timing out the next system. A second, deeper trough will quickly follow the first. Ahead of this feature, Pacific moisture will be drawn into the region promoting ample cloud cover Saturday. In fact, models are becoming a bit more aggressive with the possibility of showers as early as Saturday afternoon—especially the ECMWF. The GFS has been the more consistent of the two with this system, steadfast with most of the rain holding off until Saturday night and Sunday. We will need to monitor the trends over the next few days to provide some answers to carnival season activities slated for Saturday.